BALTIMORE (Stockpickr) -- Thursday's 2% drop in the S&P 500 was just the warning shot. Nasty as yesterday's selloff may have been, there's a lot more downside risk left in the market this summer. And that's all the more reason to unload the "toxic" stocks from your portfolio. The broad market has been long overdue for a correction. In fact, heading into this week, the S&P 500 is looking at its longest stretch yet without a correction back down to trend line support since this orderly uptrend kicked off almost two years ago. Right now, that support level is down at 1880 in the S&P 500. No, that's not exactly a catastrophic market crash -- but it's certainly a material correction. And remember, that's just in the broad market. Some individual names look due for much bigger declines this summer. That's why today we're taking a technical look at five toxic stocks you should sell. Just to be clear, the companies I'm talking about today aren't exactly junk. By that, I mean they're not next up in line at bankruptcy court. But that's frankly irrelevant. From a technical analysis standpoint, sellers are shoving around these toxic stocks right now. For that reason, fundamental investors need to decide how long they're willing to take the pain if they want to hold onto these firms in the weeks and months ahead. And for investors looking to buy one of these positions, it makes sense to wait for more favorable technical conditions (and a lower share price) before piling in. The last quarter has been rough for shareholders in $10 billion energy utility Wisconsin Energy (WEC - Get Report). In those last three months, this name had lost a whopping 11% of its value. By comparison, that makes the S&P's modest 2.5% run look like a breakneck rally. The problem is that WEC looks primed for an even bigger drop in August. 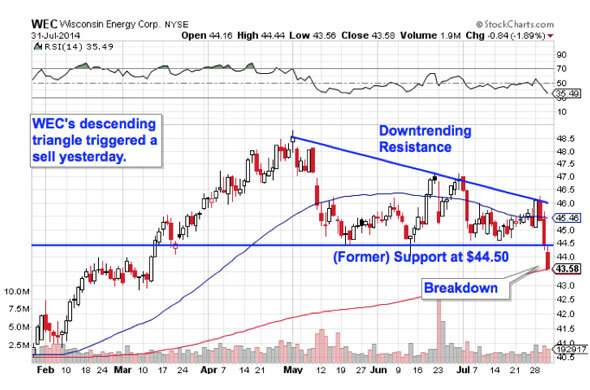 WEC spent the last few months forming a descending triangle setup, a price pattern formed by horizontal support below shares at $44.50 and downtrending resistance to the upside. Basically, as WEC bounced in between those two technical levels, this utility has been getting squeezed closer and closer to a breakdown below that $44.50 price floor. That level got violated in yesterday's session, signaling a sell in WEC. From here, the next-closest support level of note is down at $41. Bargain-hunters should wait for a bounce off of that level before trying to step in front of sellers on WEC. Chasing yield could be hazardous to your health in shares of this large-cap utility stock. We're seeing the exact same setup in shares of Mindray Medical International (MR - Get Report) right now. 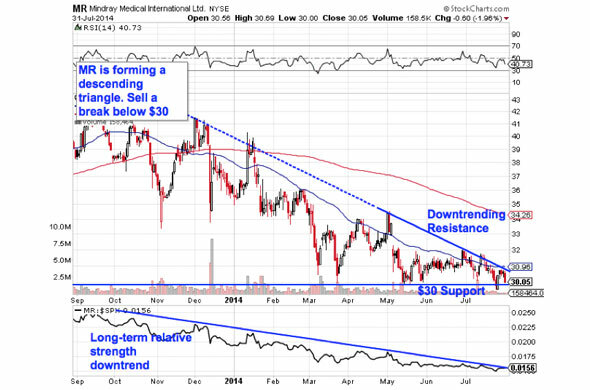 Like WEC, this mid-cap medical device maker is forming a descending triangle pattern. The big difference here is that this setup hasn't triggered yet. Until then, the breakdown level to watch out for is support down at $30; if it gets broken, MR becomes a high-probability sell. Not that it makes a whole lot of sense to hold on in the meantime. Shares of Mindray have been trading lower in a downtrend for a year now, down 24% since last summer -- the descending triangle setup in shares now just signals a potential acceleration in the downside risk here. That bearish bet is being confirmed by relative strength in MR. The relative strength line has been making lower swing highs going all the way back to last September, an indication that this name has been underperforming the market this whole time. Since relative strength is statistically a very good predictor of price action on a rolling three-to-ten month time horizon, it's a red flag worth heeding from here. Boston Scientific (BSX - Get Report) is another medical device maker you don't want to own right now. And you don't need to be an expert technical trader to figure out why this stock is toxic. BSX has been bouncing its way lower in a textbook downtrending channel since the calendar flipped to 2014, and now, with shares coming off of resistance for a sixth time, it makes sense to sell the bounce lower. 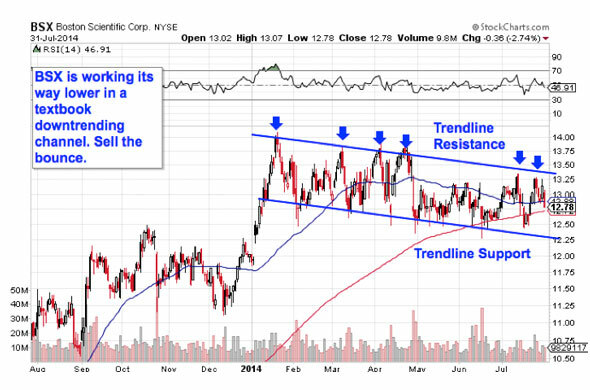 BSX's downtrend is identified by a pair of parallel trend lines that started back in January. Put simply, those lines identify the high-probability range for shares of Boston Scientific to trade within -- and they're pointed lower from here. I wouldn't want to be long BSX unless shares can break out above the top of the channel. So with shares failing to do that once again in July, it makes sense to sell this bounce. Waiting for that bounce lower before clicking "sell" is a critical part of risk management, for two big reasons: It's the spot where prices are the highest within the channel, and alternatively it's the spot where you'll get the first indication that the downtrend is ending. Remember, all trend lines do eventually break, but by actually waiting for the bounce to happen first, you're confirming that sellers are still in control before you unload shares of BSX. American Airlines Group (AAL - Get Report) is one of the few names on this list that's started off the year on an impressive note. In fact, year-to-date, shares of the legacy air carrier are up a whopping 54%, utterly crushing the broad market's performance so far. But if you've been along for the ride, it makes sense to eject this stock; shares are looking "toppy" this summer. 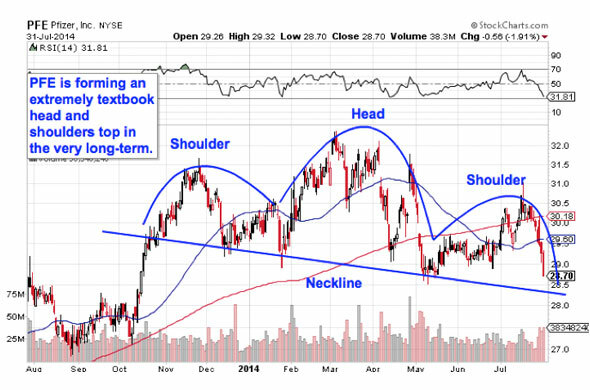 AAL is currently forming a head and shoulders top, a setup that indicates exhaustion among buyers. The setup is formed by two swing highs that top out at approximately the same level (the shoulders), separated by a higher high (the head). The sell signal comes on a move through ABBV's neckline at $38.50, a level that's been important from a technical standpoint going back to May. Momentum, measured by 14-day RSI, is throwing off some extra hints at a neckline break in AAL: our momentum gauge has been making lower highs since the head and shoulders started, even while the price action kept re-testing $44. Since momentum is a leading indicator of price, owners should think about taking gains as soon as American violates $38.50. 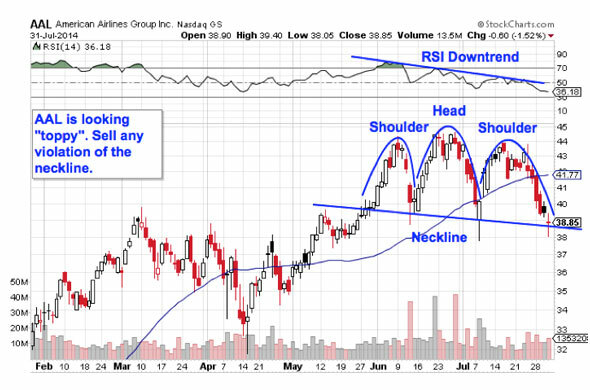 Pharmaceutical giant Pfizer (PFE - Get Report) may not have much in common with American Airlines from a business standpoint, but it's showing traders the same chart this week, with the key difference being that PFE's head and shoulders pattern is much more long-term. That means it also comes with longer-term trading implications to the downside if and when that neckline gets broken. The neckline level to watch here in Pfizer is $28.25, a line in the sand that shares are perilously close to this morning. If you decide to go short shares of PFE, the 200-day moving average is a logical place to keep a protective stop. Lest you think that the inverse head and shoulders is too well known to be worth trading, the research suggests otherwise: a recent academic study conducted by the Federal Reserve Board of New York found that the results of 10,000 computer-simulated head-and-shoulders trades resulted in "profits [that] would have been both statistically and economically significant." That's good reason to keep a close eye on AAL and PFE this week.